The omens and warnings of Anything Can Happen and In Iowa ensure that the mere mention of natural phenomena in decline awakens fear of global threat. The first-person speaker recounts a personal experience flying above the massive glacier behind the town of Hōfn in south-east Iceland. 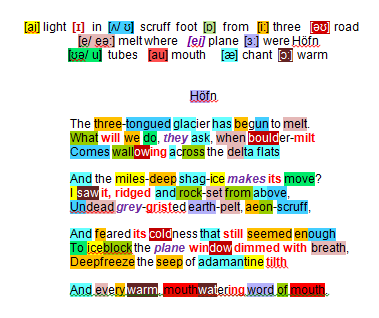 Heaney writes his headline: an ice mass of huge magnitude is thawing: The three-tongued glacier has begun to melt. The Icelanders foresee a bleak scenario as things warm up – boulder milt (most likely a porte-manteau word combining ‘melt’ and ‘silt’) – liquid momentum sending geological debris seawards (wallowing across the delta flats) and age-old miles-deep shag-ice shifting. Seen from a plane the moving (undead) glacier appears as he might have expected: irregular projecting surfaces laid on rock ridged and rock-set, flour coloured (grey-gristed), with animal skin textures (earth-pelt) its nap resulting from the age-old inter-grinding of ice and rock (aeon scruff). … and put a block on the speaker’s mental ability to compose and transmit his feelings: every warm, mouthwatering word of mouth. When first and last lines are juxtaposed an ironic contrast is generated between Nature’s three-tongued glacier and the single-tongued human mouth – Man, acknowledged by most to be the major threat to the environment, is inhibited from reporting it. The sonnet also teaches us something of Heaney’s personality: the man who on this occasion ‘came’ and ‘saw’, leaving us with an abiding feeling of his and by extension our vulnerability.